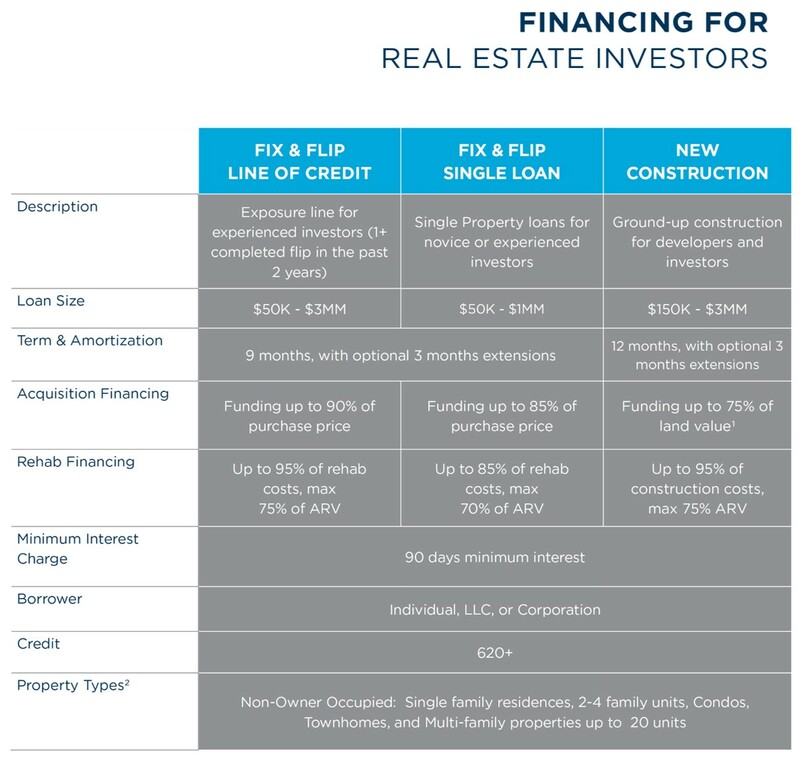 The Fix and Flip product is a Line of Credit (LOC) that allows investors to finance not only the acquisition of a property, but the renovation costs as well. The maximum, approved LOC is based primarily upon credit score and an approximate 5x multiple of proven liquid assets (e.g., $50,000 in proven liquidity x 5 = ~$250,000 Line of Credit). The liquid assets can be pooled among partners, and can come from checking, savings, and/or retirement accounts, and even come from a gift. Another unique feature of this Program is that, unlike other programs, in which the lowest credit score of multiple applicants is used, when there is more than one individual applying for the LOC, we use the HIGHEST credit score for all applicants. The Fix and Flip product allows you to finance up to 90% of the purchase price, AND finance up to 95% of the total renovation cost, AND have a final, after-repair loan-to-value ratio of up to 75%! Unlike traditional mortgage products that require down payments on investment properties as high as 30% or more, the Fix and Flip program only requires a 10% down payment! On a property with a $200,000 acquisition cost, that 20% in down payment savings means an investor has an additional $40,000 to use towards closing costs and/or for another project. Once approved for a LOC, an investor can have one or more projects going simultaneously within that LOC. Draws are made and tracked within each project, are sent directly to the investor's bank account via ACH, and are usually received in the investor's bank account within two days of approval. The LOC stays open for nine months (12 months for New Construction), with an additional three-month extension available, giving investors ample time to complete both Renovation and New Construction projects. Another significant feature of the Fix and Flip is that, as the 12 month windows approaches, the investor can choose to renew the LOC. Further, if the investor has additional liquid assets, the amount of the LOC can be increased, allowing them to increase the scope and/or number of properties they are able to take on. 1 Land must be already improved/developed for use (ie., ready for utilities and plumbing.) All applicable building permits must be submitted; if building permits not submitted, funding limited to 60% of lower of land value or purchase price. 2New Construction Single Loans are ineligible for multi-family property types and New Construction loans are ineligible for condo property types. Product not offered in all states. Loans are subject to investor and business credit approval, appraisal and geographic location of the property, and other underwriting criteria. Loan amounts and rates vary depending upon loan type, LTV, verification of application information, and other risk-based factors. Application fees, closing costs, and other fees may apply.